What was the inspiration being Blushing Pearl? There are certain styles and line qualities that I am drawn to as an artist, which in turn show in my work. Blushing Pearl is inspired by things organic in nature, such as patterns, colors found in nature. Blushing Pearl is fashion/design inspired as well, which adds sophistication and diversity. Culture and life surrounding Blushing Pearl are both big influences as well. What is the most fun aspect of creating custom cards and other paper lovelies? The most fun is the creative/designing part! Here I can play around with infinite options. Printing can be a fun aspect as well, because seeing your final product is a reward in itself! I love creating mushy Valentine's day cards and baby ephemera. I also love designing wedding invitations suites and seeing the final day come together using the invitation as the inspiration for the whole wedding theme. 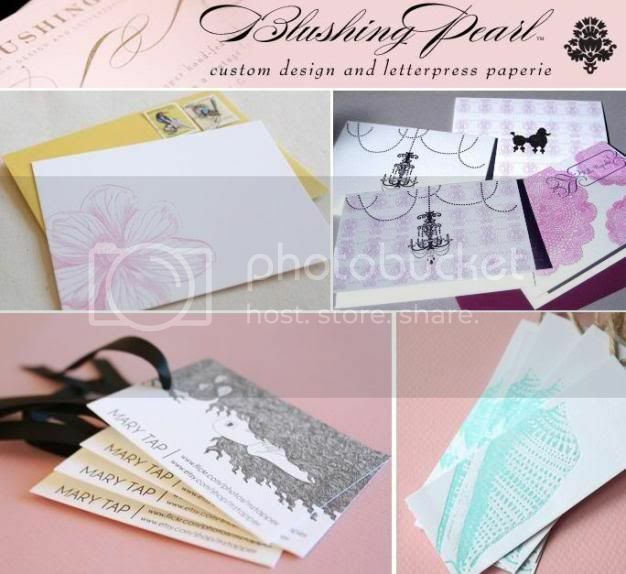 Visit Blushing Pearl & come back to let me know what your most favorite design is. I love the "Make a Wish" card! I am always looking for cute birthday cards. the love coasters are fabulous! Me too ... the Make a Wish card is perfect! Love the vintage lace baby announcement! Coaster's are beautiful too...and I'm a follower! wow she sure does make some beautiful cards! one of my faves is the Muchas Gracias- Letterpress Printed Blank Cards QTY/6! especially b/c i love pink and yellow and the design is soo lovely! i am a follower of wild and precious, blair! u know i love you girl! i added blushing pearl as a favorite on etsy (sandyalamode)! I'm not sure if it's been a month since I won a giveaway here, but I'll enter just in case. Love the Pearly Shell-Letterpress Printed Gift Tags QTY//8. So much great stuff! Love the Whispy and Erin notecards. How exciting! I love her Muchas Gracias- Letterpress Printed Blank . I want that! So pretty. AH so fun!! beautiful stuff she has!!! I think my favorite so far.... is the Flora and Fauna Social Stationary. Love the colors. The Love coasters are so, so beautiful. My fav is definitely Chartreuse Magnolia! I love the Whispy stationary set - so pretty! All of her items r produced with amazing craftsmanship. That way I can have some 'Love' and share it with friends and family! Her artwork is so beautiful! Love her pearly shell letterpress. 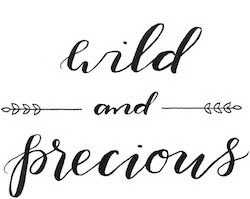 #2: Following Wild and Precious via google! #3: Following Wild and Precious via google! I love the Letterpress LOVE Coasters, the texture and fabulous flourishes are so great. The coasters are soo adorable! you know i am a follower!!! OMG I hate saying that but I love the chandelier note cards! I absolutely love the designs on the Letterpress LOVE Coasters! lovely! my fave item are her "flair" gift tags. great design. I love the Chartreuse Magnolia Letterpress its so cute! I'm faithful follower of your blog! Just tweeted about the giveaway. These are beautiful note cards! Oh, her work is GORGEOUS. Seriously. Simple and elegant. Two of my favorite things. I love her Pearly Shell design. All things beach are attractive to me. Thanks for hosting, Blair and thanks for giving, Marsinha. Love these cards! Great giveaway! Also, added Marisnah to my Etsy favs!!! I liked the Nitecrawler design with the owl. It looked Native American. The Letter press LOVE coasters are my favorite! I love the Hello Cupcake Vintage design! Super duper cute! I love the Raspberry Magnolia Flat Notes. They're beautiful! My favorite is the "XOXO I Love You" cards! I love the sweet and simple bride invitations and the love coasters! I absolutely adore the "Whispy Personalized" card design. It is elegant and feminine - to beauitiful for words! Thank you for this lovely opportunity. I love the French collection, especially the poodle! I added Blushing Pearl as a favorite on etsy. I really love the merci thank you notes. Everything is so beautiful! I love the let's catch up letterpress cards with that adorable bird! I like the thanks a lot cards! The make a wish cards are great. Nice to meet you- I would have followed even if I didn't enter this giveaway. I like the Blue Magnolia Letterpress Printed Flat Notes-QTY/8. I like the Love Coasters. I love the Vintage Gothic! I added them as a favorite seller (heylyss09). I voted in both categories for Nashville Best Of. LOVE the letterpress love coasters...such a great shop, thanks so much!! I now have their etsy shop as one of my favorites! My favorite is the Le Chandelier Note Cards. I really love the Raspberry Magnolia design!! I love the Magnolia Flat note... Thank you!! I like the Love N Respect design. My favorite design is Love is Blind. Everything on the site looks really elegant. My favorite design is the Raspberry Magnolia. I like the vintage gothic personalized stationary! My mom was born and raised in Kauai so I would love the Mahalo thank you notes. favorite is in the sale area: waves blank note cards. I like the "Mahalo" thank you notes the best. I love the Merci Thank You notes. I love the Fifi French Poodle and Lace. My mom would love them since she has a black poodle. I love the Chartreuse Magnolia Letterpress design...really all the magnolia designs. Thanks so much for the giveaway!